Located in Russellville, the law firm of Randal K. Epley — Attorney at Law assists with more adoptions in southern Kentucky than any other firm. Adoption is the most rewarding part of our practice. Our family law firm has helped bring families together for over 30 years, and we would be delighted to assist you with navigating the adoption process swiftly and efficiently. We handle all types of case, including stepparent and grandparent adoption, involving both the voluntary or involuntary termination of parental rights. Your family is our focus. Our law firm also provides comprehensive estate planning advice and probate litigation services to help you plan for your family's future or resolve estate administration disputes. Every client receives focused, one-to-one attention from our principal attorney, who will guide you through every step of the process with skill, understanding and care until your legal needs are met. When a family law crisis happens, we can help you to protect your assets during a divorce, contest or negotiate child custody and visitation rights, or resolve disputes over alimony and child support. We will ensure that you fully understand your legal options at all times, and we will always pursue the best interests of you and your children. If you are facing criminal charges, we provide assertive and effective representation backed by decades of criminal defense experience. For those struggling to find work or housing due to a past conviction, we can help you to clear your record through expungement and make a fresh start. 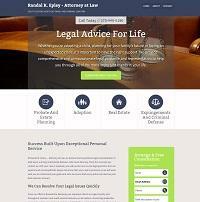 At Randal K. Epley — Attorney at Law, we provide legal advice for all of life's major events. Whether you're confronting a legal dispute or making plans for the future, we have the knowledge and experience to help you succeed.